Home » Wiggly Buttz Blog » Danger Zone » Can My Dog Eat This? You know the obvious (which we’ll include in the list shortly) but there are some everyday items that you may not realize can be toxic to your pet. Please check this site regularly for updates. Although it is not known what component of the grapes or raisins causes renal failure in dogs, certain possibilities have been ruled out, including various pesticides, some heavy metals such as zinc and lead, and fungal contaminants. That dogs react in this fashion to both commercially-produced grapes and those grown informally in their owners’ back yards indicates the likely culprit has nothing to do with the growing or cultivation process but is instead basic to grapes themselves. In other words, all grapes are potentially dangerous to dogs–both grapes in the plump, “just picked” form and as their dried counterparts, raisins, and regardless of whether they came from the store or off the neighbor’s vine. Don’t feed your dog grapes or raisins, and don’t leave these foodstuffs out where he could help himself to them. This is not to say you need live in fear of your pooch’s keeling over dead if he swallows a grape or two. However, if he downs a handful of grapes or even a smaller amount of raisins, get him to your veterinarian right away. Aggressive treatment with intravenous fluids and close monitoring are his best chance for survival. 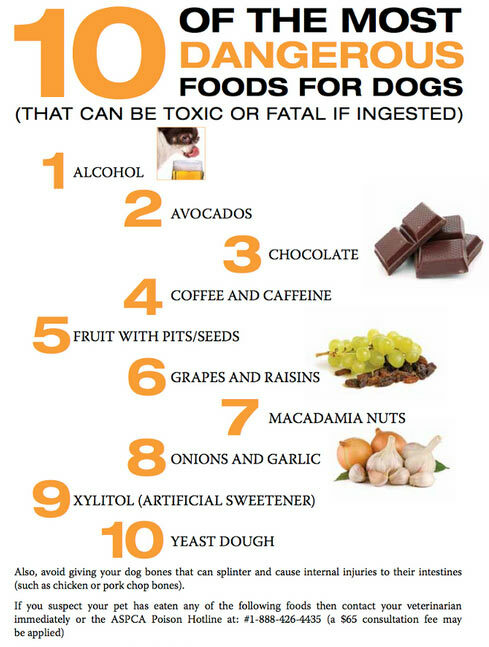 Grapes and raisins aren’t the only people foods known to be dangerous to man’s best friend. Chocolateand cocoa can prove deadly to them. Chocolate’s toxicity to animals is directly related to three factors: the type of chocolate, the size of the animal, and the amount of chocolate ingested. Unsweetened baking chocolate presents the greatest danger to pets because it contains the highest amount of theobromine, approximately 390-450 mg. per ounce. White chocolate contains the least. WARNING: Several companies sell mulch with cocoa in it. Be sure to check your gardening supplies BEFORE you use them, and make sure you do not have cocoa mulch! Xylitol is a sugar alcohol used in candy and chewing gum. It is also found in some pharmaceuticals and oral health products such as chewable vitamins and throat lozenges. It can also be used in home baking. immediate veterinary treatment to survive. Without help, irreversible brain trauma occurs and the patient dies. Xylitol also appears to cause severe liver damage in dogs within 24 hours. According to a study published in the 1 October 2006 Journal of the American Veterinary Medical Association of eight dogs who had ingested Xylitol, five died of liver failure, and an additional three canine deaths that occurred after the study was completed were also determined to stem from that cause. While more research needs to be done to categorically prove that Xylitol actually causes canine liver failure, at this time indications point that way. As to how to prevent such poisonings, recognize that dogs are long on sweet tooth and short on judgement and act accordingly. Do not leave tasty items lying around. Put sugar-free gums and candies where dogs can’t get at them. Keep chewable vitamins out of the way too. If you bake with Xylitol, store the resultant goodies well out of your pets’ reach and do not hand-feed them bits of Xylitol-laced muffin as a treat no matter how much they beg.